McDonald’s – a name that brings a smile on the face of foodies makes them to connect to this happening food chain with its logo acting as the trigger. The two French fries that are bent to form a ‘M’ on McDonald’s logo make you to chuckle, isn’t? Thanks to the cropping up of the fast food chains like Burger Kings, McDonald’s, KFC and the like- our taste-buds have been cuddled and pampered to the awesome flavors of a deadly trio- hamburgers, French fries and soft drinks! A fast food fanatic swears by this wholesome snack when it’s munching time, adding that dash of super deliciousness to a all-friends hangout! 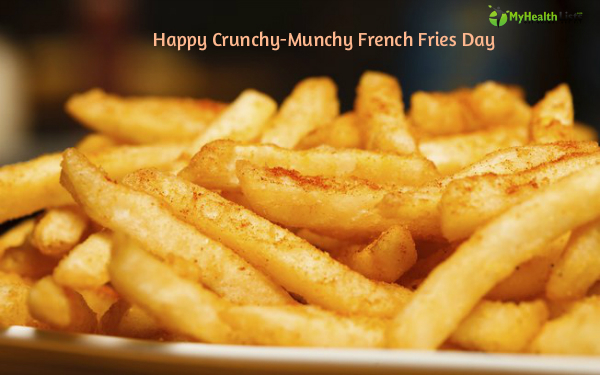 July 13 is celebrated as National French Fries Day! Just give in to your temptations for these finger-shaped, golden brown, crispy fries on this day. Generation Y is touted as health conscious- as hitting the gym is definitely on the cards of many members of this Generation after relishing the creamy dips and wolfing down many calories. This National French Fries Day let’s not be so strict and ban our taste-buds from the yummy-feel of a bit oily, crispy fries. A small dip in the pool of self-indulgence for a day will not make you pile up more and make you to fret about your love-handles! Check out how you can go about it! • If you always have a higher inclination to order the largest size on the menu available, why not swap the bigger pack of French fries with a kids’ pack or the small one? • There are some food chains and restaurants that claim to use peanut oil for frying the potato waffles. So make a small enquiry and go the heart-healthy and low-calorie way with French fries fried in peanut oil! • Whether it is the curly fries, waffles, wedges or shoestring, why not pin point a healthy cut? Yes, opt for a thicker one as greater surface area means less of it is fried! • Eat slowly, eat few and rejoice with your golden friends dangling in your fingers. When you take a look at your platter- the crispy ones must stare at you, never let those waffles, wedges or shoestrings to disappear in a jiffy! Have you been missing the cooking zone for quite some time? Then why not hit the kitchen and try some healthy and creative options on this special day. Baking or roasting potatoes help you to do away with the consumption of oil. Cut the potato in thick pieces, add a sprinkle of herbs and put those in the oven till your eyes meet that golden brown color of the potatoes. You can also grill potatoes along with other veggies and relish. Go right calorically by opting for healthy alternatives of the potatoes like zucchini, Kohlrabi (read turnip cabbage). Try out some veggie dippers along with yogurt, kale and sour cream. The tangy flavor of the veggie dippers are the best thing to resort to when you have that hankering for frying French fries. You can opt for nutritional yeast chips which are really crispy! Junk food lovers do not lose your heart, savor the pack of sodium, salt and oil or the French Fries and celebrate this French Fries Day, zestfully. However, go for the healthy substitutes the other days to stay in shape and be happy!